Boiler feedwater enters the vertical deaeration section above the perforated trays and flows downward through the perforations. 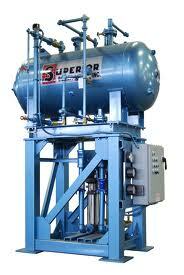 Low-pressure deaeration steam enters below the perforated trays and flows upward through the perforations. Some designs use various types of packing material, rather than perforated trays, to provide good contact and mixing between the steam and the boiler feed water. The steam strips the dissolved gas from the boiler feedwater and exits via the vent at the top of the domed section. The deaerated water flows down into the horizontal storage vessel from where it is pumped to the steam generating boiler system. 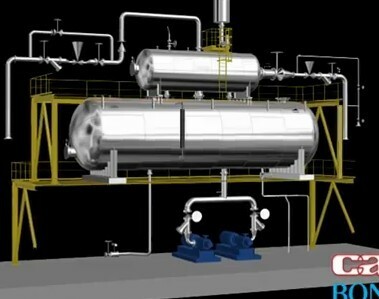 Low-pressure heating steam, which enters the horizontal vessel through a sparger pipe in the bottom of the vessel, is provided to keep the stored boiler feedwater warm. External insulation of the vessel is typically provided to minimize heat loss.